Used to make a smaller print look bigger within a frame and also to enhance a print within a frame or to prepare a print for presentations to clients, for awards and competitions, Bainbridge mats enhance and off-set the print as either a bold statement with bright colour contrasts or simply to hold interest to the print within a neutral colour mat such as black or soft-white. The mats are custom made so they can be made to suit almost any print dimension including panorama print sizes. V grooves can be added to any Standard or Competition mat adding an extra dimension to enhance the mat by tending to give the illusion of a double mat of the same colour. Because only a single mat is used costs are reduced as a second mat does not have to be cut. See examples. The V Groove can be set at 5mm, 10mm, 15mm, or 20mm from the aperture. 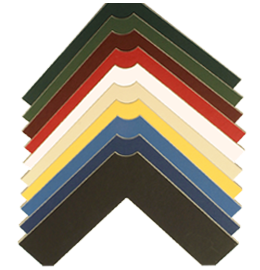 V Grooves attract an extra cost of $2.05 per mat. Low profile mats of less than 2.5mm specifically designed for competition use are professionally assembled ready to display with the supplied print mounted and backed at very cost effective prices. A Bainbridge competition mat can be prepared to your club or competition organizers specifications as for instance large print category with 16x20" maximum outer size mat for an 8x12 print. The opening there-by giving a four inch border all round the print aperture. To order with prints through DigitalWorks Pro-Max internet print ordering program, indicate the specifications and mat colour in the notes/instructions area on the Shopping Cart page, and we'll do the rest. Standard Mat: 16x20 Maroon mat board only for 8x12 print. V Grooved Mat: 11x14 Black mat with 15mm V Groove for 8x12 print.